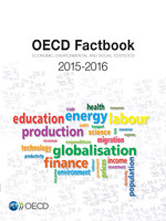 OECD Factbook is the best-selling, annual title from the OECD. It provides a global overview of todays major economic, social and environmental indicators. More countries than ever are covered in greater detail, enabling direct comparisons for many indicators between OECD Members and Brazil, China, India, Indonesia, Russian Federation and South Africa.